On an azure shield with a gules bend per sinister and argent-sable embattlement at the bottom. In the centre there is a rearing argent Horse leaning onto the or Key. 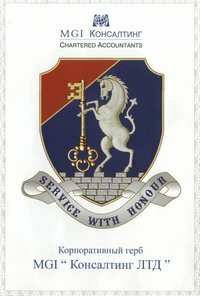 The noble Horse leaning onto the Key (the truth), embodies the courage of a lion, the eyesight of an eagle, the strength of a bull, the speed of a deer and the agility of a fox along with honesty, loyalty and perfection, selflessly defending the truth and the honour of the house guarded by it. Or - stands for aristocracy, power and riches along with Christian virtue, mercy and humility. Argent - stands for nobility, frankness along with purity, innocence and truthfulness. Gules - stands for courage, braveness and love. Azure - stands for magnanimity, honesty, loyalty and perfection. Horse - embodies the courage of a lion, the eyesight of an eagle, the strength of a bull and the agility of a fox. Key - stands for home, truthfulness and also problem-solving.